A Stormy Autumn and visit to Ireland. News from the Deep. Caught between two storms, conflict resolution and drifting on the winds of change… that’s a little of how it has felt for me inwardly too this Autumn… so here’s a part of the story I am willing to share. 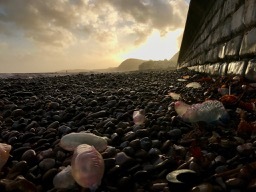 The picture above shows some Portuguese men o war washed up on my home town beach of Sidmouth, photographed the evening that Hurricane Ophelia blew on through. I liked the metaphor that the jellyfish are not one organism but a collection of organisms. Just like we are a collection of life stories and experiences playing out of the subsconsious..and that only occasionally, sometimes after stormy weather do some of the stories from deep in our past wash up on the shores our consciousness, re-minding us, and giving us a chance to see what has been influencing our present choices and actions on the everyday level. How perfect, I thought, that my last blog post was all about mindfulness – and that current events were bringing up just how un-mindful I can be sometimes!! Three days after Hurricane Ophelia I flew to Ireland in readiness for a keynote and workshops on Storytelling Outdoors for the Irish Forest School Association…but storm Brian was looming and threatening floods and more strong winds…I decided to visit the conference venue to make a back-up plan if we really had to be indoors. On the way I checked out a small area of exposed Limestone pavement to see all the mini trees and bushes sheltering in the eroded fissures, just as the front edge of the storm arrived and began to soak me from the waist down… and then conference organisers decided to postponed the conference for the greater good of those travelling that night and early the filling morning to the venue. I was greatly disappointed and also greatly relieved because I was stressed about doing the speech and workshops in the storm. And I was all at sea internally too. My heart ached. I needed some rest, but I still had a storytelling gig to do that night at a school in Galway. Remembering to breathe, I looked outwardly again. I felt the weather around me and noticed clusters of red berries with five pointed star on them, silver drops of water clinging below them. With all the ups and downs of the past few months I intuitively reached for, gave thanks for, and nibbled some Hawthorne berries to have as medicine… I figured hawthorns growing in this environment were going to have strong heart medicine! (did you know that Hawthorne is associated with the heart and is said to help bring blood pressure into balance?). I got back into the hire car and put the heater and de-mister on full. Aren’t cars amazing clusters of technology and include shelter, mobility, warmth? The gig in Galway went well. So I had a free day in Ireland to contemplate some of the big stories going on in my personal life that were coming to the surface and bringing with them strong emotions. I was also enjoying listening to an Audio book I was finding extreemly useful ( Getting to Yes with yourself by William Ury http://www.williamury.com/books/getting-to-yes-with-yourself/). Storm Brian was not as bad as expected and I was safe to go outside, travel to Spittal on the coast near Galway and then back east to Wicklow later in the day. In the hills behind Spittal, the granite was scoured by ancient Glaciers. Again, I found myself in a place of exposed bedrock. Raw. Old boulders littered and dumped. New windmills. As the rain clouds of Brian cleared I sat in the sun, thoroughly enjoying the warmth of its intermittent rays, and asked for help to make decisions based on inner important values, to help happiness return while not necessarily being attached on particular outcomes, because on some level my happy, playful otter or dolphin was dying under the weight of some of the things going on in my world. I found it striking that when I returned to Devon, the seas were red and grey misty like an image of a dolphin slaughter somewhere in N Europe I had seen in the news while waiting at the airport. While spending time in the woods and talking with a dear friend by a big old ash tree I realised that a current painful dilemma was actually a mirror of painful childhood traumas which revolved around decisions, people and home, and that this was probably a big reason for the lack of joy at some levels of my life. The cycles of the seasons mean that now, with Samhain, the spirit of the land is returning to rest underground and the old year is coming to a close…. and thus in some ways the new cycle of the year beginning in readiness for the spirit of the land returning at Imbolc. It’s a great time to let go of the year, be grateful for all that happened this year, for the ancestors to be acknowledged too, and maybe seek the wisdom of elders in the long winter nights, dive into the stories and shadows of our past and re-emerge, or evolve with greater understanding and wisdom ourselves, part of the cycles of the seasons. The Storytelling for Outdoor Learning course is very successful! 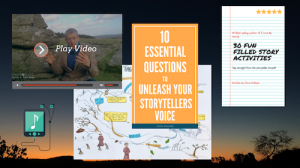 This spring, as many of you will already know, I launched an online course to help forest school leaders, teachers, parents and educators become better storytellers and ultimately to help thousands of people connect with nature through story related activities outdoors. It’s been so successful with many participants saying how it is just what they needed and giving them confidence and a huge amount of activities and inspiration. 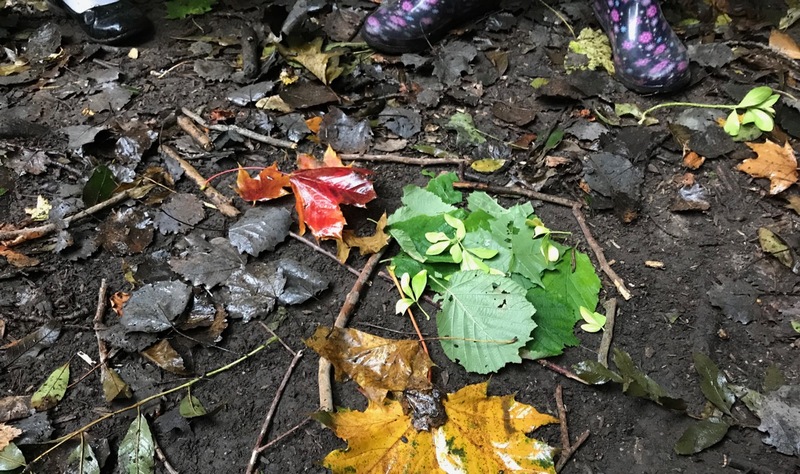 Syncronistically, I noticed, the Cycles and Seasons theme is the theme of the story I am currently working with on the Storytelling for outdoor learning course I am creating! For more info on that see here: http://www.storytellingforoutdoorlearing.com In each season of the year and our lives we have gifts and fears and that the best way to be part of the cycles of life is to remember to let go of our fears, be generous with our gifts, and to breathe and relax when troubles arise to allow the cycles of the feelings come and go and help us evolve. I also had a shift in language while in Ireland. One of my favourite storytelling tips I picked was to do with words. A fiend told me that in translation “I am sorry” in English in Gaelic is “Sorriness is upon me”. The same goes for happiness and other emotions… I thought I need to use that more in my stories and in my own way of speaking. Maybe you might find it useful too? PS. If you want to sign up now for The Year Course with a 20% off discount, valid until end of November 2017, type in down2earth at the checkout. Click here: https://storytelling-for-outdoor-learning.thinkific.com/courses/theyearcourse or click the button below!